Did you know you can pick sage at a public park - for free? If you know where to find it and what it looks like, of course! But most of us think of foraging as a stone-age activity, except for the highly specialized art of wild mushroom foraging. I know of people who have foraged for nettles, but I never did nor knew how. Under the radar, the duo Urban Outdoor Skills and Transitional Gastronomy have taught small groups of people how and what to forage nearby and how to prepare not just edible, but gourmet dishes from the pickings. The class meets at Hahamongna Park, just east of the 210 Freeway in La Cañada Flintridge. When you enter the park, keep driving until you see the restroom building. The class meets at a picnic bench next to that building. Pascal Baudar of Urban Outdoor Skills then takes the students around to forage while Mia Wasilevich of Transitional Gastronomy stays behind to prepare lunch. Until our foraging class, I had never heard of chickweed. The edible chickweed looks similar to purge, which isn't. 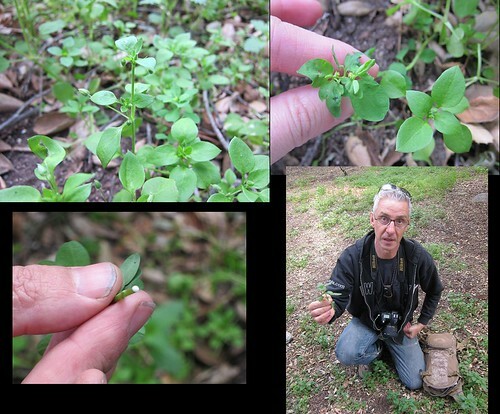 The difference is that chickweed has pointy leaves, lighter green color, and fine hair and buds that look like bells. Its flowers are white with what looks like 10 petals but actually 5 split unto 2. To make distinguishing them easier, if you snap the stem, purge will release sap. 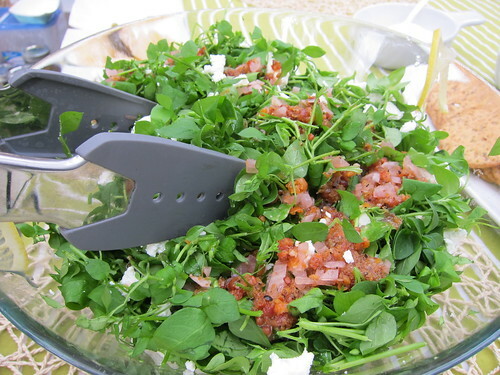 Chickweed is actually very nutritious and filled with vitamin c, calcium, and iron. He showed us how to pick stinging nettles without getting pricked (thorn prick can cause skin irritation). 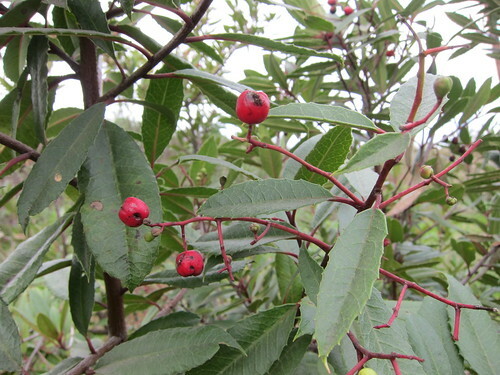 They're edible after being blanched and can supposedly lower cholesterol. 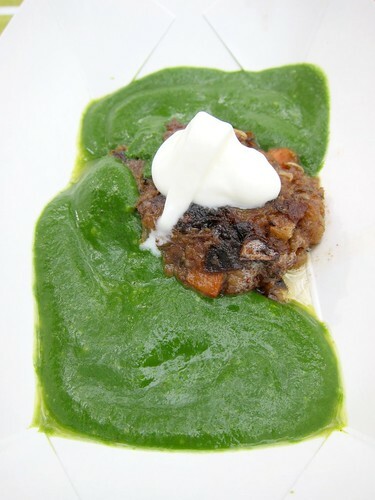 They make a nice sauce too, Rustic Canyon has a pasta dish with nettle pesto. We encountered many interesting plants along the way. There were various traditional cold remedies like horehound - all of which apparently taste nasty. The Black Night Shade is a good remedy for nettle sting, and the western variety is completely edible once the fruit turns black. Mugwort can be used to make beer and has antibacterial and insect repellant properties (they were also used for witchcraft - drinking its tea supposedly gives you "vivid dreams"). There was Datura, a natural LSD that smells like peanut butter but also lethal if you overdose. Oxalis has natural acid and tastes exactly like lemons. Apparently you can use them to curdle cheese but don't juice them, as it can cause oxalis crystals in your body. Shepherd's purse can be used as a pepper substitute in cooking. Beware of hemlocks. They look like they might be radish or carrot tops, but they are extremely poisonous, and I mean extremely. We grabbed generous amounts of California sage, free here compared to however much they are at Whole Foods. The park also has both white sage and black sage. We didn't make it in time to pick toyon berries, a starchy berry which were edible and (almost) taste like cherries once you cook it to remove the cyanide. You know it's ready to pick when the birds are picking them - but that also means you have a short window before they eat them all. Returning to our table, now it's time to taste what we can make with all the stuff we saw earlier. 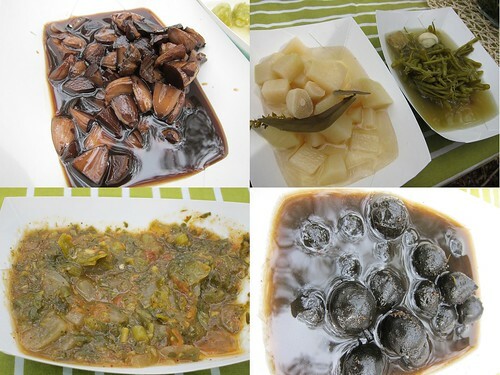 Mia of Transitional Gastronomy had prepared a veggie burger made with acorns and eggplants, topped with nettle sauce. We all loved both the acorn burger and the nettle sauce, but apparently acorns are pretty time consuming to cook and you have to grab them from forest grounds before the rain comes, so I'm probably not about to go get my own acorns. You should be able to substitute chestnuts for the acorns, though. I kept scooping up the nettle sauce even after I finished my burger. The chickweed is a little bitter but really fresh and healthy tasting. It's great with a sweeter dressing. 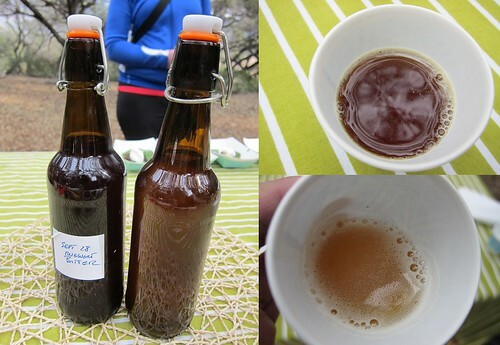 The mugwort beer is not bad, a bit bitter, but I loved the nettle beer which was light and almost cider-like. For those with hops allergy, you'd be happy to hear that there are no hops in these beers. We then finished off with Mia's acorn sticky buns. This foraging class was much more interesting and educational than I had expected, and they taste better than expected too! If you're looking for something interesting to do on the weekends, do consider taking one of their classes. The class schedules are available on both their website. Coco Cafe: Coconut Water and Coffee? Yes!